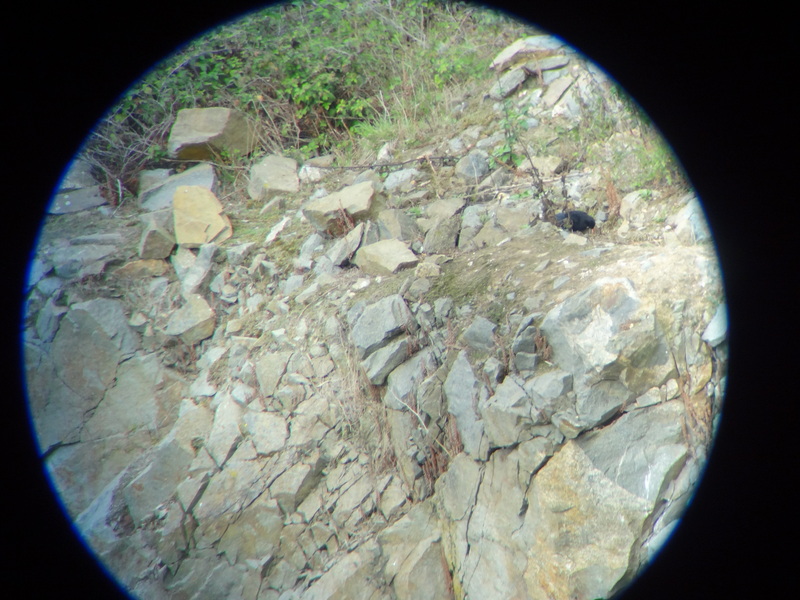 Chough release update – where’s Wally? Shortly after the last update, our two choughs, the Ronez 2, chose to go back to the plan and re-joined the flock in the aviary none the worse for their sojourn in the quarry. After the pair settled, we returned to the plan for slowly releasing the choughs. On the afternoon of 6th September we opened the hatches again. 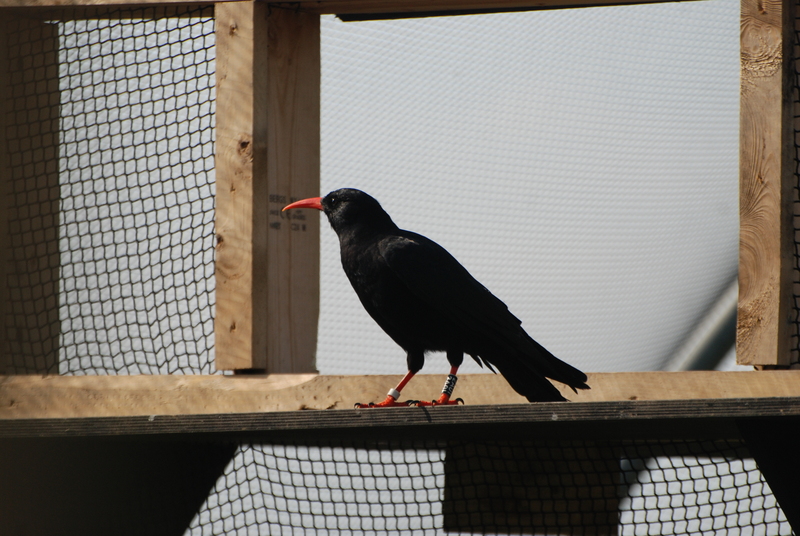 This release started off promising: all the choughs left the aviary within the first three minutes. Green and Mauve (the Ronez 2 pair) were the first to leave as expected and went onto the first target board outside the aviary. The rest quickly followed. We watched nervously as a flock of crows appeared heading to Mourier Valley. I think the choughs were vocalising before flying up, but all I remember was seeing the crows detour to the aviary and all the choughs take to the sky. There was lots of circling and calling (mostly the choughs). There was no aggression just mutual intrigue. As the crows lost interest and the choughs headed towards Mourier Valley I decided to call them back. It would have meant they only had 15 minutes outside but that was better than losing the group. Whether the calling scared them or they ignored me, I will never know, but it certainly didn’t change their flight pattern. Once over the valley they turned towards the cliffs and split up. Five were on the cliff path close to the aviary; White somehow became separated and was seen flying inland to the Sorel Point car park. In the meantime Red and Orange had made it over to the other side of Mourier Valley and could be seen probing the ground seemingly content. Green and Mauve returned to the aviary, possibly in response to whistles, or because they knew the lay of the land, and were locked in. Then, to add to the stress, as rain appeared from the west, Red and Orange flew inland but back towards the aviary. For some reason only Red returned, resuming her previous ‘post-release’ position on top of the shed roof! The rain at this stage became too heavy and the team called a halt to the search and retreated. When the rain stopped and we returned to the aviary, Red was still on the roof and was lured in quicker than last time. The radio-tracking gear told us that the remaining four had split up. Two by the aviary, one still in the field by the car park and one at the bike track. We were not able to see them as the light had gone by this stage. Nothing had really changed when we returned at 06.00 on Saturday which, understandably, was worrying with still no choughs in sight. Our immediate concerns were for the two signals by the aviary. To save an agonising, minute by minute, account of the dawn searches, we can say that we found one chough hiding in the low hedgerow close to the aviary alive and well. Well enough to fly off towards the car park. The second bird we picked up down the east side of Sorel Point. We found White was also hiding in a low hedge in the barley field by the car park. On location she flew off towards the bike track and carried on to the east side of the quarry. So, by 08.00, we had established that all were alive and well and in the quarry and were eventually able to see three of them feeding on a high bank, their calls carrying well on the wind. It took the best part of the day for White to join up with the other three: when they did so, they settled at the top of the quarry on the south-west corner. They roosted there on Saturday night on the bank rather than in a building and stayed in the quarry throughout Sunday. While we had more rain and strong winds, plus motorbike races, on Sunday the four choughs appeared to settle well in the quarry. And there they have stayed. We can follow their movements thanks to the tracking equipment and are learning to spot their distant activities through binoculars and telescopes. It’s surprising how many shadows, rabbit holes or dark rocks can suddenly look like birds from a distance. 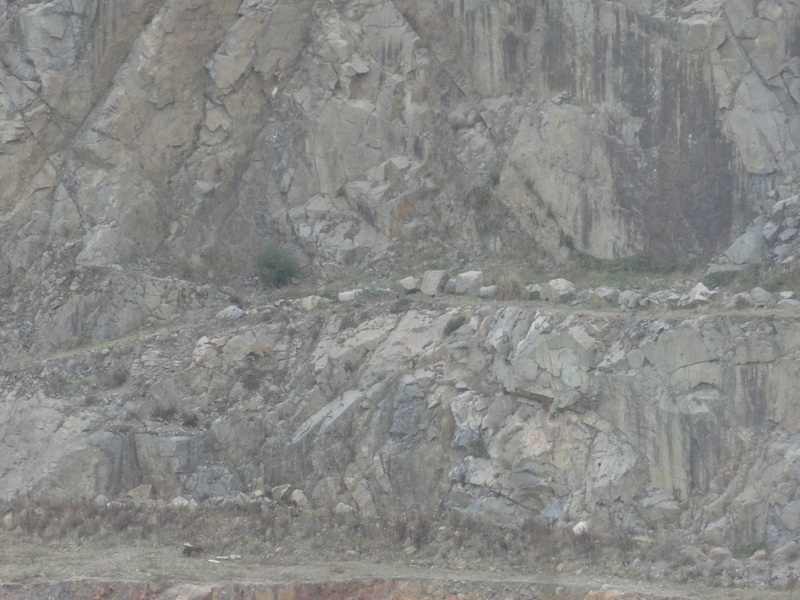 And a group of four crows live in the quarry. 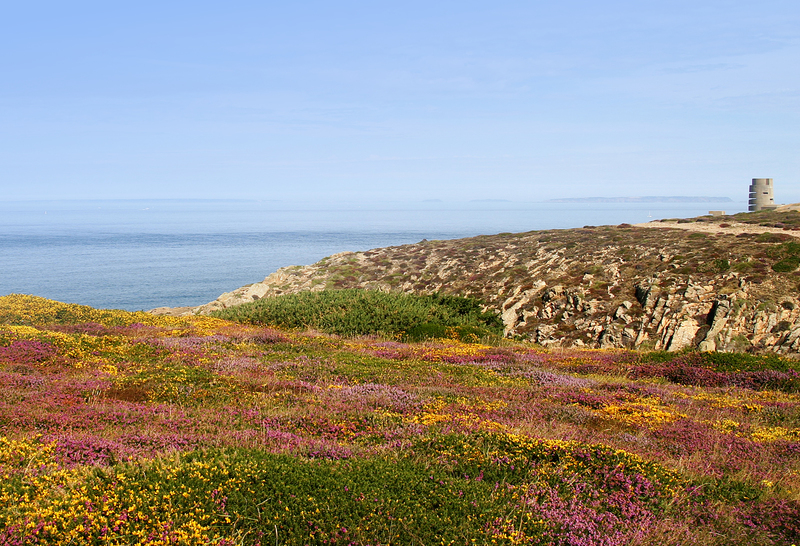 However, we are becoming very adept at differentiating choughs from crows when they are so far away you can often only barely tell they are birds: our own game of Where’s Wally? Luckily choughs do get up and fly around and call in a way that only choughs can. Spotted them? If you look closely, they are right in the middle of the picture. If you use Neil’s telescope, however, they look like this! And, as for the three in the aviary. They seem ok, eating well and responding to the whistle. Red does look a little forlorn by herself – last week she sat on the aviary roof all night rather than be separated from Orange. Now she doesn’t know where he’s gone. 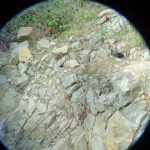 This entry was posted in Bird monitoring, Blog, Choughs, Sightings, Top News by Glyn Young. Bookmark the permalink. It certainly is a privilege to be associated with this project. So good to hear frequent updates on them all. Good luck with the tracking and I hope to hear more exciting news soon!